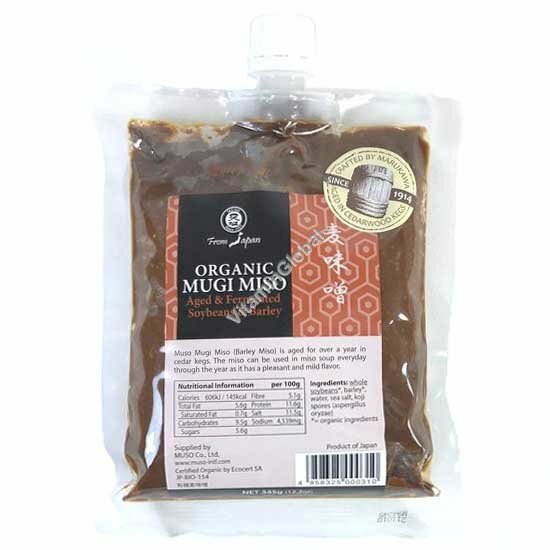 MUSO's Mugi miso comes from a family owned miso company with over 60 years’ experience using traditional methods. Barley miso begins its processing in the coldest part of the winter season with fermentation beginning quietly in the spring, and the peak fermentation occurring during the rainy season of summer when the humidity and the temperature are at its peak. As the fermentation settles down during the coolness of the fall season, the Miso's taste and aroma are brought to perfection. The miso can be used in miso soup everyday through the year as it has a pleasant mild flavor. Ingredients: organic whole soybeans, organic barley, water, sea salt, koji spores.